DIVORCE 911 consulted with Jennifer Keaton of 2 Steps Divorce for this blog post. The first is not being emotionally prepared for the change. Having not come to terms with the fact that a marriage is ending and the grief that comes along with that is a major issue. Being prepared to deal with that reality. Now, you won’t want to but you need to be at a place where you want the bleeding to stop. The second is not having your financial information pulled together. If you don’t know your financial future… you will soon enough… And it won’t be pretty! Knowing the cost of that post-divorce apartment, or what health insurance is going to cost you is imperative. If you don’t know these things you’re not ready to talk about how to part ways. Remember, in most cases, your daily expenses have now doubled and your income has been cut in half! The third way is not knowing and understanding the alternatives. These alternatives include the courthouse and the legal pieces of information that you will need. Understanding how things are divided and granted under the law is important to understand. Having this legal information will allow you to make informed decisions and also be prepared to talk about a huge amount of information. Let’s make sure your Divorce Mediation does not fail! Divorce mediation can be cheaper than hiring attorneys to litigate (battle!) your divorce, but only when it results in some agreements or significant traction towards agreements. One of the best ways to set your mediation up for success is to take the time to get prepared – emotionally, intellectually, and financially. Denial is a frequent visitor to the divorce process that undermines its potential for success (if this your situation, consider Discernment Counseling). Great offers often are rejected when emotions are not managed well or legal counsel is not present to assist in negotiations. In those cases, mediation is not a cheap solution, it is an additional expense. On the other hand, a mediator is a great facilitator of solution-focused discussions that can move the divorce from battle-ground to a settlement that can shorten the legal process by months (or be used for an uncontested divorce). When some or all issues are resolved in mediation, the emotional and financial costs of moving through the legal process are cut down immensely. 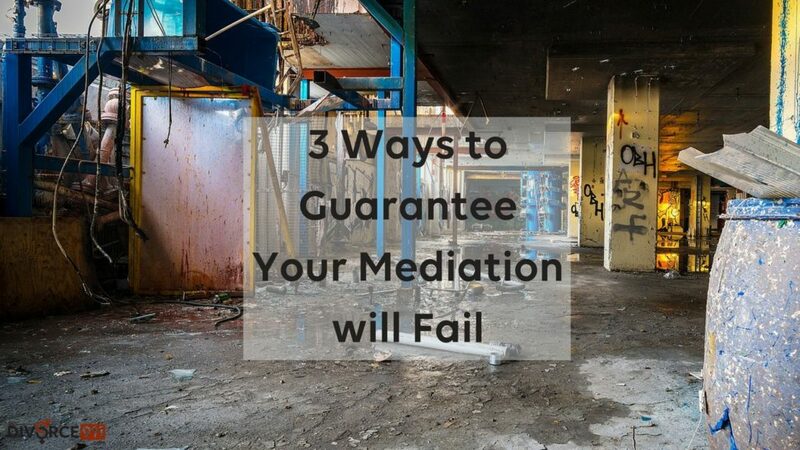 Mediation is hard work and positive endurance on both sides to strike a deal where no one gets everything that they want, but enough to be satisfied. We Can’t Agree, So Why Bother With Mediation? Why do Georgia Courts order most divorce cases to participate in mediation? Because it works! Litigation applies pressure (time and money) to parties that often makes a settlement look better than waiting on a judge. Courts also find that many cases resolve a large percentage of the issues, leaving them with less work to do. It’s easy to see why courts like mediation, but do the spouses like it, too? Not every family will reach agreements in divorce mediation. For those that do, it is often because they are emotionally ready to discuss hard topics and have done a lot of preparation ahead of time. The “homework” of divorce involves a lot of number crunching, understanding how likely you are to win or lose at trial on certain issues, and how ready you are to take on the new demands that will be on you (financial independence or transitions, parenting with less control when then kids are away, etc.). It can be scary. It may be scarier to toss these decisions to a judge at some unknown time in the future – a critical reason that mediation works for so many families in transition. For most individuals facing divorce, this is their first time. Inexperience leads to major mistakes. Uncertainty exacerbates stress, shortens fuses, and brings out the worst in most of us. How do you regain control? One step is to get informed about the legal process of divorce. Divorce 911 offers resources, and there are other options such as “Divorce 101” through Visions Anew Institute (www.visionsanew.org) and the online or in-person class “Crash Course Divorce” from 2 Step Divorces (www.2stepdivorces.com). Understanding the legal process can help individuals see a way through the fog and avoid wasting emotional and financial capital on matters they thought the court would care about (but won’t). Getting information helps move individuals into a healthier space, even if it means acknowledging that it’s still going to be hard. Very hard. I’m Afraid of Attorneys As Much As I’m Afraid of this Divorce! Most of us have never hired an attorney. In divorce cases, this inexperience coupled with fear can lead to huge legal expenses. As an attorney and mediator, I encourage parties to “buy what they need when they need it” when it comes to hiring an attorney. There are four common ways that attorneys provide services in the separation and divorce context. http://www.2stepdivorces.com/watch-videos/ Most individuals start with the “Ferrari” of legal services (sometimes it’s unavoidable) when what they really wanted was the “Honda” of legal services. Understand what you’re buying when hiring your attorney, and be cautious of over-purchasing or purchasing the wrong legal services.